Just to recap the external surface was floor tiles which had become a bit of slip trip hazard and we at Drive-Cote Ltd a local resin bonded resurfacing company Rise Park intend to strip back all of the tiles and possibly save for reuse internally and clean up the concrete base. 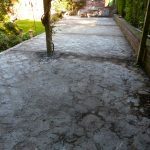 We would then recommend a curing time for the base to dry out naturally before any further works are completed. 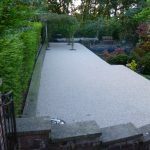 Once dried out we could then use the base as a surface for our resin bonded stone installation. Remedial works completed we will then seal the concrete prior to any install. 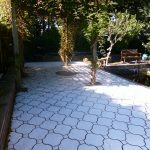 The client had decided to have the works completed as not only had the loose tiles become a bit of a trip hazard, the actual walking surface of the tiles was extremely slippery. 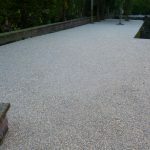 Coupled with the clients increasing restricted mobility and the need for a low maintenance surface. As we have talked about before whilst this is a worst case scenario uneven and slippery surfaces can create real issues which is now being replaced! Whilst the weather continues to be kind we have been able to cut down on our waiting list and complete works ahead of schedule. 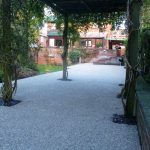 This Drive-Cote Ltd resin bonded resurfacing company Rise Park completed the project within budget and before the expected date. 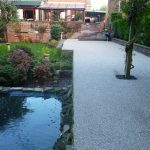 Another anti slip, and virtually maintenance and weed free option. 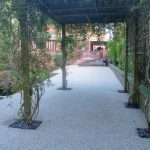 Please note not all surfaces are suitable for our resin bonded stone and not all purposes suit our resin bonded stone. As an extremely anti slip surface, it is not suitable for playground purposes such as for small children and we would not advocate it. Mansfield, Ashfield, Ripley, Heanor, Codnor, Ironville, Pinxton and South Normanton all within easy reach of our base in Nottinghamshire. 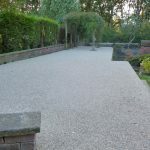 This entry was posted on Saturday, October 29th, 2016 at 7:35 am	and is filed under Chesterfield, Concrete, Derbyshire, Diary of a Mansfield Resin Driveway Company, Latest News. You can follow any responses to this entry through the RSS 2.0 feed. Both comments and pings are currently closed.